Panda Audit Service assesses the risk level of all applications installed across your corporate network. Monitor and control the behavior of all processes run on all of your computers to identify viruses and other threats that can’t be detected by traditional antivirus products. Is your organization aware of the applications used by the employees? The usage, willingly or not, of non-work related applications is an increasingly common reality. This activity compromises your personnel's productivity, the bandwidth consumption, the operational costs due to different incidents generated when using uncertified software, and the security of your organization. Panda Audit Service offers full visibility of all running applications in your organization. Is your organization protected against targeted attacks and other advanced threats? These new types of attacks challenge most of the traditional antivirus. They are indeed very complex with highly sophisticated distribution. But Panda Audit Service unveils what others fail to see. It can diagnose the risk level of all applications running in your organization, monitoring and granular controlling each executable process in every single computer of your IT infrastructure. Is your organization in control of who access confidential information and when? Since the beginning of the Advanced Era of Malware, these attacks have been motivated by economic or political interests. Why do you need Adaptive Defense if you already have an antivirus in your company? The volume of malware has increased exponentially and attacks have become far more sophisticated. Economic gain, industrial sabotage, simple curiosity or industrial espionage have become the main target of these attacks. Panda Audit Service offers full visibility over all applications accessing data files and the possibility of making forensic analysis of the actions executed by the malware. Complete visibility of all applications being run by each of your employees connected to your corporate network. 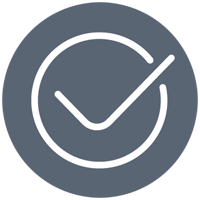 Continuous monitoring of the activity of all applications gives you detailed information about the actions of each process. Identify critical vulnerabilities in the software in use on your network. Detect any application designed to steal confidential information from your business. Use real-time audits to discover if your intellectual capital is in danger and which users are accessing files containing confidential data. Discover if your company is vulnerable to targeted attacks and advanced threats targeted attacks and advanced threats that can’t be detected by traditional antivirus products. Get immediate alerts when threats or malware are identified on the network, with a full report detailing the infected computers and the action taken by the malware. Clean infected computers with our remediation tool (Panda Cloud Cleaner). Panda Audit Service displays what is happening, where is being carried out and which is the activity's origin of any running process. Panda Audit Service offers real-time detailed information about each action executed and identifies critical vulnerabilities. From the beginning of the audit you will see if you have been or if you are victim of an attack. Continuous monitoring of the activity and the analysis carried out with the Big Data technologies in our cloud environment will allow detecting targeted attacks and other advanced threats before they undertake any action. With Panda Audit Service you will know who and when is accessing which files or folders. Over 90% of the attacks take advantage of known vulnerabilities. Panda Audit Service allows you to identify critical vulnerabilities in the running applications. 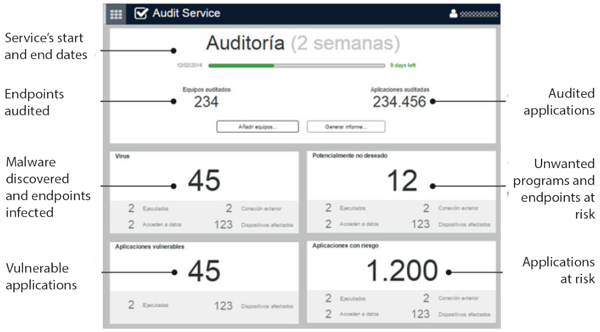 Panda Audit Service displays real-time information about the audited endpoints and applications. Based on this information it generates detailed reports for your organization to establish preventive measures. Panda Audit Service is based on a light agent (20Mb) which can be easily deployed in your infrastructure through software distribution tools within minutes. It does not require any other configuration, server infrastructure or database to begin the audit service. Operating systems (workstations): Windows XP SP2 or later (Vista, Windows 7, 8 and 8.1). PandaDefense.com is a division of Virtual Graffiti Inc, an authorized Panda Security online reseller.